Monday .. day 0 in the countdown. On Monday .. off to the Palace again. This time to put all the stock out. Our stand design was inspired by our recent fruit and veg appliques and we wanted to create a potting shed feel. 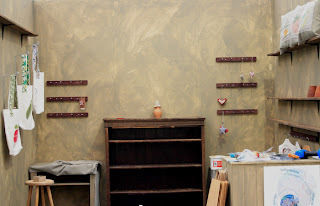 We used an old door stained up , old roofing boards, victorian clay plant pots (some i had , others sourced from my local recycling centre) and an earthy wash for the walls . Painted and ready for the stock to go in. A quick preview of the finished stand. The galvanised watering can for our flowers is borrowed from my mum ... it was originally my Grandads ( my earliest memories of gardening were with my Grandad ). Will put up some more detailed shots tomorrow but i need to sleep now.. it's been a long day. All is going well at the show. We have had great feedback about our new products and have sold lots of stuff. Tuesday was a great day, despite the bad weather. Thanks for comments about the website .. my mr ' lovely' is pleased that you have found it's easy to use and that the feed back has been positive. Once the show is over we will add more bits and tweak it and hopefully do the online 'buy now ' thing too. Your stall looks lovely - I was amazed at the CL Scotland how many people just turned up and didn't really personalise their stands very much. For a bit of time (and to be honest that is probably a case or organisation as the non-decorating people didn't seem to get their stalls up any faster!) and a tin of paint it is definately worth it. I would be very interested in feedback about how this goes - I like the way your stock makes a coherent, while varied, collection. Your stand looks wonderful, love the idea of having the "old potting shed" look to match in with your new products, very clever! Hope you do fantastically well, can't wait to hear all the tales of the fair! Looks great, love the garden type theme which of course is so very appropriate for the venue. Glad to hear that you are selling, looking forward to hearing a full report later, when you have recovered! So glad to hear the show is going well. I hope yesterday was as good as Tuesday. The stand looks really lovely. Had a look at the new website and it looks great. Good luck with the rest of the week and hope you're not too exhausted by the weekend! 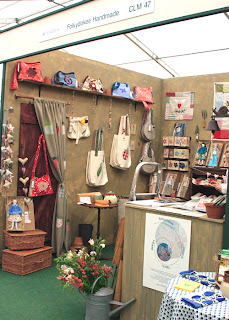 Glad to hear the show is going well, your stand looks lovely and the potting shed theme is perfect.